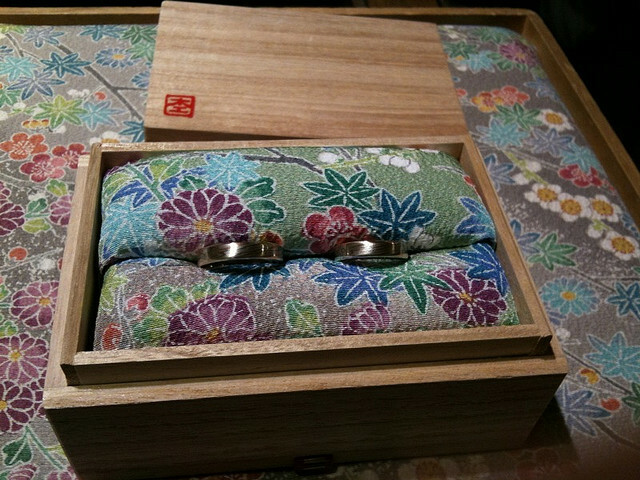 Nowadays, marriage ring is one of things groom should never forget to prepare for his wedding ceremony in Japan, but as you can easily guess, wearing marriage ring is not a Japanese tradition. In fact, it seems people just started wearing wedding ring as a sign of love between a married couple just after the war. Of course, it is not a must item, there must be some people who still don’t wear it seeing some industrial strategy behind the trend. I assume the younger you are, the more you are used to this new custom, but how many people in Japan actually wear wedding ring you think? I found an article which surveyed just above 500 people in Japan who are going to marry soon or who have been married for less than 3 years. As a result, 96% of them are happy or satisfied with their wedding ring, and typical amount people pay for each wedding ring is somewhere over 10K yen (US$960) for both groom and bride. But yes, question here is if they often put it on or not. According to the survey results, approx. 73% people put it on every day or almost every day, 13% wear it only when they go out, and 9% put it on their off. Please let me know situation in your country, too!